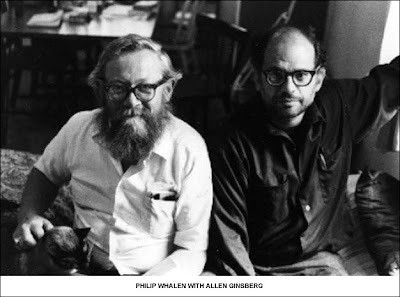 In 1959, Philip Whalen (shown in the photograph below, with Allen Ginsberg, at a somewhat later date) was just 35. He'd been a key figure in the Beat Scene in the Bay Area for some time, since settling there a decade earlier, following his military service in WWII, and the taking of a degree at Reed College in Oregon, where he met his friends Gary Snyder and Lew Welch. 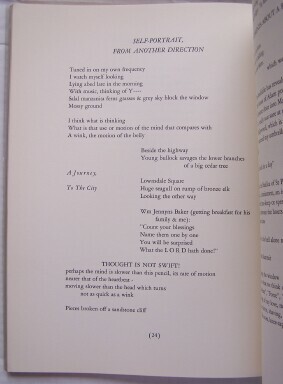 (He'd read, with Ginsberg, Lamantia, Snyder and McClure at The Six Gallery in 1955). Nevertheless, he hadn't published much by this time, partly owing to a native shyness and general modesty of disposition. 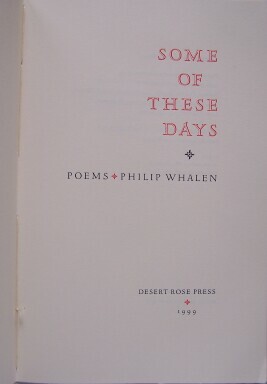 By 1959, Whalen more than deserved a book, and the fledgling printer Dave Haselwood (who would later be joined by Andrew Hoyem), who had just started his Auerhahn Press a year or so earlier, offered to publish Philip's first real book (there had only been four broadsides done previously of PW's work). 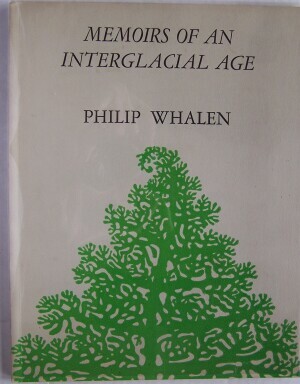 That book would become Memoirs of an Interglacial Age, a very tastefully done, unusually large format (for a poetry book--8 3/4"x11") collection of poems, 49pp, with woodblock cover illustration by Robert LaVigne. There weren't many copies printed, and it's uncommon outside the inventories of the rare book dealers these days. 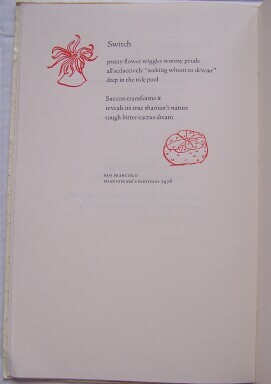 Whalen's compositional style, derived in part from his exposure to the teachings and example of Lloyd Reynolds--the genius calligrapher of Reed College--an experience and influence he shared with Gary Snyder--both of whom used wet-ink pens for the rest of their lives--was to compose his poems in notebooks, by hand. 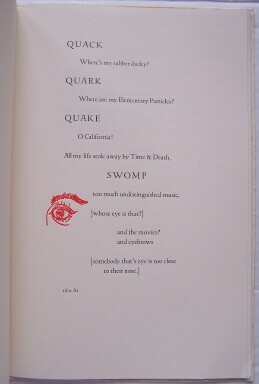 Typically, his poems would be divided by lines or stars, and words of different sizes and positions would be employed. This might have become the despair of traditional printers, but Haselwood mediated the transition to distributed print fonts creatively, establishing a format which would be used throughout Whalen's career. The small press tradition of the Bay Area in the 1960's, and after, valued the text: "The first & final consideration in printing poetry is the poetry itself,” Haselwood wrote in 1960. 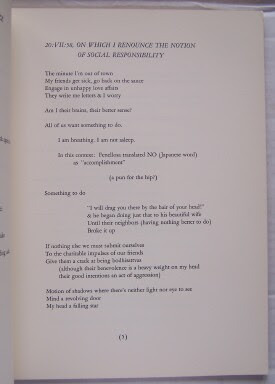 “If the poems are great they create their own space; the publisher is just a midwife during the final operation & if he has to do a lot of dirty work that’s the way it should be. Contrary to what a lot of people including publishers think, publishing is not a gentleman’s profession, it is the profession of a crook or a madman." Aside from the "dirty work" of somehow scrounging up enough bread to pay the press and paper costs (not to mention the rent), the "poetry itself" should dictate the terms of its realization as material text--a key priority that was understood, then, though occasionally, in our relentlessly expedient and slap-dash capitalist culture, something we tend to forget. The pleasure and delight of Whalen's early book, so lovingly produced by Auerhahn Press, was a talisman of a time and place, not forgotten by those who lived then. Another important Bay Area pressman, Clifford Burke, who ran the Cranium Press in San Francisco beginning in the mid-1960's, the author of, among other things, Printing It: A Guide to Graphic Techniques for the Impecunious [Bookpeople: 1981], knew and treasured the Whalen book, as many of us did. A wonderful example of the synergy which takes place when art and technology (albeit a somewhat outmoded craft, surviving on proverbial shoestrings of patience and sacrifice and love) join to make the perfect object/artifact. And Burke didn't forget. Over the years, he dreamed of producing books like those early Auerhahn editions, and the dream didn't die. When I first heard about the Desert Rose Press edition of Whalen's new book Some of These Days , I called Burke in New Mexico--where he had moved in the early 1990's, to concentrate on the production of fine press poetry broadsides, cards and books--to inquire about availability. Burke was genial and welcoming, and explained how the publication of this new book--which was one of Whalen's last books while he was still alive (he died in 2002)--was a celebration and commemoration of the earlier Auerhahn book, which he (Burke) had always admired and regarded as a standard to aspire to. This new book was his homage to Whalen, to the memory of the earlier book, to that time, and to the perpetuation of a living tradition, of commitment to an ideal. One of Whalen's greatest gifts was in addressing matters of the greatest import and complexity, in the most ordinary language, and tone of voice. Was it audacity, to think that mulling over the everyday cares of a quiet life would constitute high art? If any writer could be said to have taken to heart the example of William Carlos Williams's injunctions to write in the accents of our ordinary speech, it would be Whalen. Who but he would think to publish the canonical "Self-Portrait From Another Direction," in which the most casual of meditations turns cosmic, a trip on three levels, complete with rueful anxieties and generous honesty? 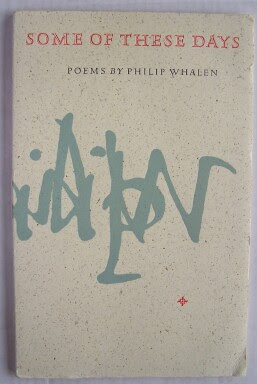 One of the simplest, sweetest things about Whalen's work is its self-deprecation, as dramatized embarrassment, all flubs and snubs and pomposities showing, all the while shrewdly patient for the telling revelation, the almost missed flicker of mysterious phenomenon at the edge of consciousness. Now that Whalen's collected poems is out, the earlier individual books may seem to have lost some of their luster. But for those of us who value the model collection, a sequence of pages, say, encapsulating a specific segment of time, 50 pages or so, these kinds of books are the very lustrum of artistic endeavor. These two books bracket the career of an important Bay Area poet of the post-war period, both as discrete writing, and as gifts of the craft of printing. The history of such books, their making, their significance, their beauty--mustn't be forgotten. Clifford Burke's edition of Some of These Days rounds out the romance of a time, a place, and the practice of a craft, as memory, recalled, rejuvenated, reinvented, relived. Alive. Curtis, how would you stack Whalen next to Moore? How would you stack Ginsberg next to Pound? I mean in terms of universal and sustaining value? Do you think the modernists were better than the postmodernists? I just "stack" them in an horiozonetal manner Alpha-betically..
We always think of you when we go there to eat. Comparing books of poetry with rice dishes--okay. My point wasn't in attempting to rank these books, but to make known the fact of Burke's intent: He wanted deliberately to "celebrate" the f/act of the earlier book, both as a commemoration, and as a homage, and to continue the tradition. I was replying to Kirby..
and his need/demand to compare that's a "bad" habit that is difficult to drop..
you got some "chops" here... and some terrific sounds/ "licks"
It's very important to rank everything. Also, Curtis, I did finally see things more or less your way wrt the health care phynances. Ron actually let my post through. Yesterday I tried bravely to be chock a block with the new bill, but this morning my paranoia caught up with me. Part of the reason I went along with the deal was that the CBO said the thing was going to work out. Now today they say that they're 1.2 trillion low in their estimates. Most of the debt is owed to Red Chinese. This means we're going to have to sell the Tibetan Monks into gonesville status. Let's rank Kirby O's Corso page, or Corso-nostalgia extortion page (which ah wager consists of old e-mails, now posted for self-aggrandizing purposes, whether the original beat-ski approved or no). Then, maybe let's have Kirby O's pastor and congregation rank it too! Pride, the never failing vice of fools. "The pleasure and delight [of?] 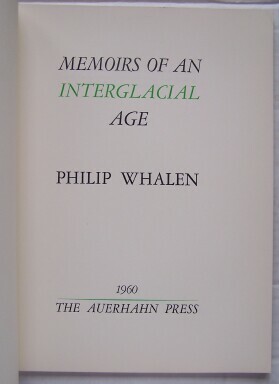 Whalen's early book, so lovingly produced by Auerhahn Press, was a talisman of a time and place, not forgotten by those who lived then." Everything is nothing but itself. One of my biggest regrets was in never meeting Phil. We corresponded briefly back in the 1970's. He was my favorite poet for a period of about five years between, say, the appearance of On Bear's Head and when I started working for the government in 1974. He looked a good deal like my Father, too, but the "resemblance" ended there. Freud's (I almost writ Fraud) closest comrad-in-harms? And re BeatnikCo--Clarkster's bon mot regarding the librarian smashing in Corso's nose was nearly priceless. Then gregorito making up his usual line of caca afterwards. Who was the macho-man Librarian? Let's hear mo' of that.